With simple, contemporary lines the appearance of the Baxter Chair is whimsical from all angles. The internal frame is constructed from MDF and beech, the strength and longevity of the latter ideal for this use. Careful consideration has also gone into the foam cushioning which, like the frames and cushioning on all Kovacs pieces, carries a ten-year warranty. 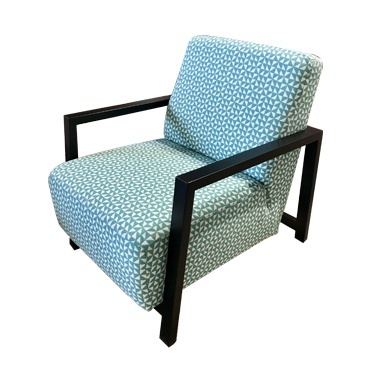 This one is upholstered in stunning Toluca Marine fabric by Harlequin. Available to order in a range of fabric or leather and a range of wood colours.